It's only been a couple of weeks since I wrote an update, but we released a few new things you may find helpful and I wanted to make sure I kept you current. First, a little update on what this year will bring for you as you grow with us. We'll continue to provide the best value out there (you may have noticed that other software providers nickel and dime for add-on features, and charge up to two to three times what Massagebook costs). Not our game - in fact, we plan on further simplifying our pricing this year. You can expect us to consistently roll out improvements and new features each month (sometimes even more frequently - like this one). We just added some additional software engineers to the team to help accelerate our progress even further. Woohoo! We've partnered with both Google and Square. As a result, we'll be able to provide all MassageBook practices with Square card processing as an option and you'll be able to swipe, dip and even accept Apple pay from a professional looking POS system. Our partnership with Google will allow your practice to appear in Google searches with the option to book right there, using the new Google Reserve program. Look for both to be introduced in the foreseeable future. The list is waaay too long to share here and includes tons of smaller improvements as well as big new features designed to further simplify managing your practice and to help you increase your income. Stay tuned to my regular emails sharing what we just released and what's coming up next to stay in the loop. Point is - we're maintaining our laser focus on making it clear that any bodywork practice not using MassageBook is at a clear disadvantage. Keep doing great work taking care of your clients, and we'll keep working hard on providing you with better and better tools (at a reasonable price) to help with all the other stuff you need to manage and grow your practice. P.S. - If you haven't created a Valentine's Day Promotion in MassageBook to sell a love-ton of Gift Certificates this year, you're missing a great opportunity! Let us know if we can help. Clients have always been able to opt-out of receiving campaign emails, but you haven't been able to manually stop the sending of specific types of messages to individual clients. 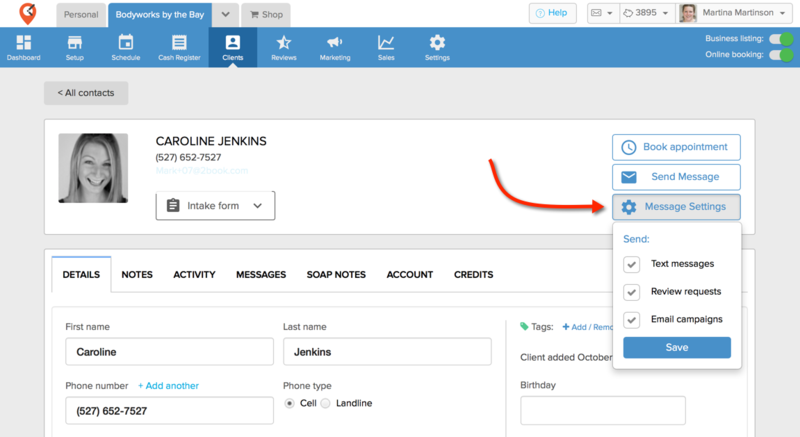 To access this feature, simply open the desired client's details, select the new "Message Settings" option, and deselect the type of message you wish to stop sending your client. It's that easy, and gives you perfect control over all messages your client receives. 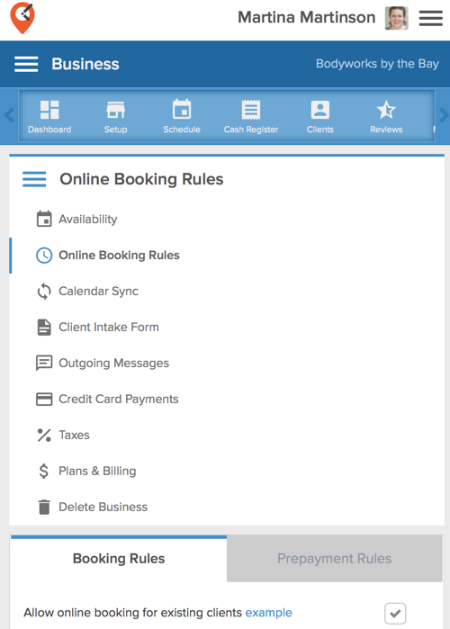 Some practices allow their clients to book services online without pre-paying. If this is the case for your practice, you probably still want to collect payment up front when someone purchases a promotion online. 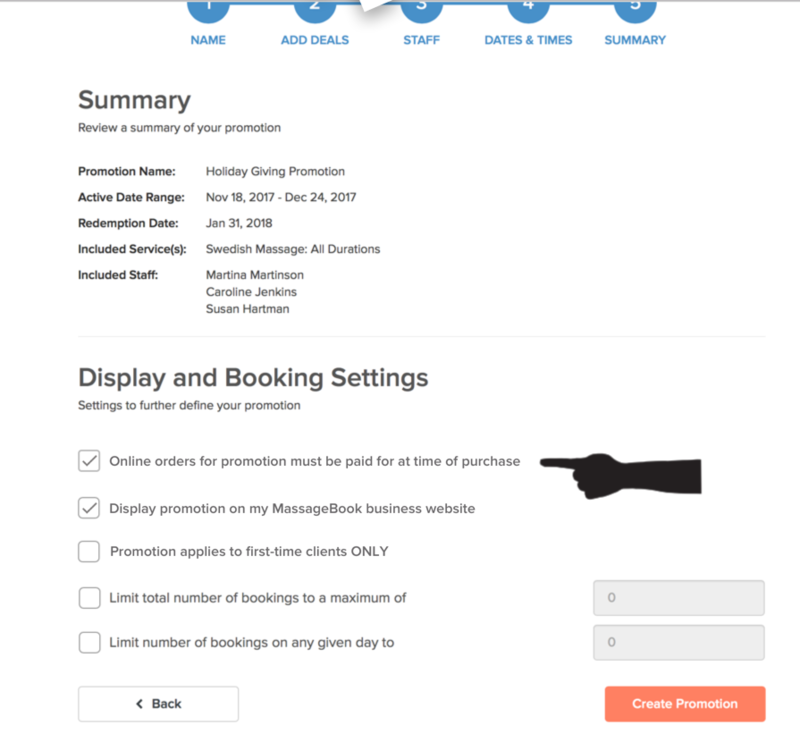 With this latest improvement to the MassageBook promotions creator, you can now specify whether you want people to pre-pay for promotions or not (even if you don't require payment for online bookings). This release we share with you the mobile friendly version of the business settings section. More sections of the main application are coming soon! We're working diligently on making the better part of the desktop version of Masagebook mobile compatible, so you can easily do what you need to in the main software from your phone. This is one of those "behind the scenes" projects that may not be the most exciting, but we know a lot of you will appreciate it nonetheless. For now, we think you'll find the experience of reviewing and changing settings in the main (desktop) version to be quite friendly to those of you who like to do everything on your mobile phones.